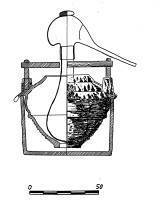 Distillation: Making a replica of a medieval distillation apparatus (campana). Investigation of the distilling process using a campana. Experiment: A campana in action. A very drinkable cherry liquor was produced. Glassmaking: Explaining glass furnaces of all times, producing glass according to old recipies, making coloured and colourless glass, studying the different cooling processes etc. Experiment: Making frozen glass using bone-ashes. This experiment has been performed in order to prove that it is not possible to use bone-ashes as a calcium source for making transparent normal glass. You can find this error in some archaeological publications, even in papers of high renown. Edition of a medieval manuscript dealing with alchemistic apparatus of the 14th century. Two examples of drawings in the manuscript: an apparatus for descending distillation and an apparatus for sublimation. Correct interpretation of Pliny’s glass recipe (see page 4). Identification of residues in medieval pharmaceutical vessels. 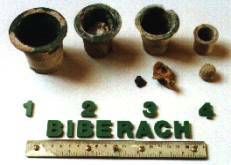 Four lead glazed vessels, found in a late medieval well, containing remains of zinc ointment, a calcium plaster and an arsenic- lead plaster. Identification of the organic and inorganic components of the paint on a leaden Zeus votive figure of the Roman Imperial Period. 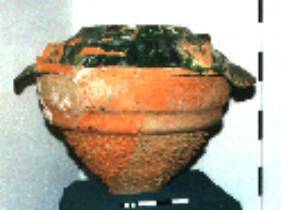 Example: A vessel excavated under a late medieval house: interpreted as an inset in a water bath. 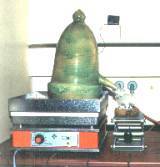 It holds the destillation vessel, a cucurbita, in an upright position. Interpretation of archaeological finds, e. g. ceramics, glass vessels, and what they have been used for. All the examples given here and others have been published.